About a month and a half back, just after finishing my talk about the collaborative economy at my hometown in front of 70 Portuguese visitors (who had come due to the 600th anniversary of the Portuguese conquest of Ceuta), I remember that the president of the Agavi association (Antonio de Souza-Cardoso) immediately highlighted the importance of crowdfunding over the last few years. A crowdfunding platform offers entrepreneurs and creators the chance to finance their projects through small voluntary donations by members of its community. If the campaign is successfully financed, the creators receive the funds collected so they can start their project and the platform keeps a small percentage fee. It’s a very upcoming trend in Spain and the whole world, specially after the 2008 financial crisis. Up until today, millions of euros have been successfully financed for a great variety of projects in this way. 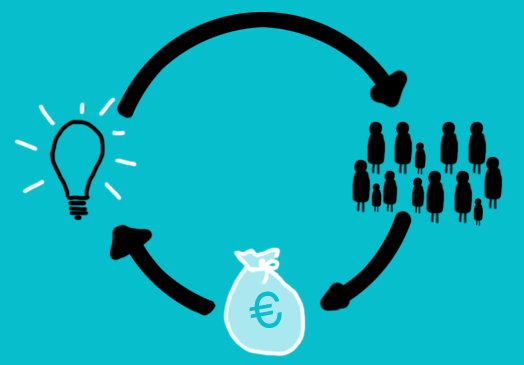 In fact different crowdfunding platforms often specialise in different types of projects. Having said that, the most common ones tend to be creative, social, cultural and entrepreneurial projects. Kickstarter, specialised in creative projects (music, film, arts, design and other types of creations), is the most successful crowdfunding platform in the whole world. Its community consists of over 9 million backers (sponsors), who have successfully financed over 90k projects via donations. Only in 2014 they managed to finance over USD 500m through the platform. This implies a great value to society, as the creators of different projects see in crowdfunding a very useful tool for accessing the needed resources to kick start their projects. Furthermore, 3 weeks back Kickstarter made an announcement that considerably differentiates them from other technological giants. Instead of following the usual path of growing as much as possible and plan an eventual IPO, they have decided to establish themselves as a “Public Benefit Corporation”. This is a type of organization just relatively recently acknowledged in the US, where it’s established that the entity is still a for-profit company but it compromises to consider the impact of their decisions on society as a whole, and not just on its shareholders. In this way Kickstarter legally reinforces the values that they have always maintained since its foundation in 2009 – having a positive impact in society, particularly from the promotion of arts and culture. From now on they legally compromise to publish and justify the social and environmental benefits of their activities. In practice, Kickstarter have always maintained considerable transparency and business ethics. For example, many of its statistics appear in their website, they assure not to sell user data to third parties, they invest in sustainable transport and green infrastructures, they donate 5% of their profits to education in the arts and to fighting inequality, they offer mentoring and training opportunities to groups underrepresented in the world of arts, etc. In short, they compromise to be a diverse, ethical, integrative and equitative company. In fact the founders of Kickstarter said that they don’t want to sell the platform or go public because they think that it would push them towards decisions that wouldn’t match their company’s values. Moreover, they’re convinced that this legal change reassures them in maintaining the path that they’ve followed up until now. Although they need the profits to develop further, their decisions will often align more with maintaining their values than with maximising their profits. This could be a problem when it comes to attracting investors or recruiting talent. However, they revealed to have managed to attract employees that are highly identified with the company’s values, particularly millenials for whom the company culture is very important. They also expect to have loyal shareholders and be able to distribute dividends in the future. In conclusion, there are different ways to value companies and I think that, as well as their profit and loss accounts, their ethical, social and environmental benefits are increasingly being taken into consideration. The “Public Benefit Corporation” in the US is a very useful way to establish an organization that sees toward the common good, as well as its profits. They are relatively new but perhaps they’re an answer towards a need for change that exists globally, and so its important follow them with attention. This post was originally published in Spanish language for El Faro de Ceuta newspaper (printed and digital versions) at the author’s weekly column.